Living Loving Local for February: Beets! Red, yellow, orange, pink or striped, beets are a superfood full of folate, manganese, Vitamin C and a good source of flavonoids to boost our immune systems and decrease inflammation. Originating on the Mediterranean coast, and initially harvested only for their greens, today we enjoy whole beets, eating the bulbs as well as the greens. More than just a vegetable, beets can be used as a natural dye and a source of processed sugar. 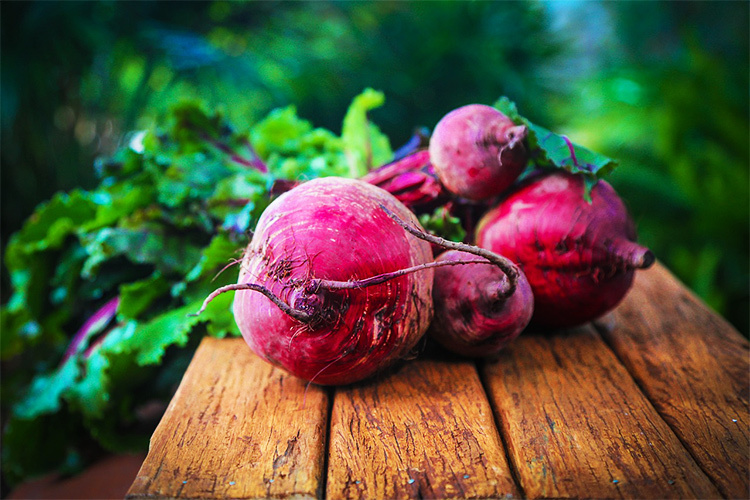 One cup of raw beets contains 50 calories, 0g of fat and 4g of fibre. They are an excellent source of Folate, a good source of Manganese, Potassium, Copper, Vitamin C, Iron and Vitamin B. The leaves are also very high in Vitamin A. Considered a superfood by many, beets are full of flavonoids that help boost our immune system and decrease inflammation. Vegetable Beets: Most commonly available in red, but also heirloom varieties come in orange, pink, yellow and even striped. These are the variety we find at our local market typically in September or October. Not only can we eat the root of this plant but we can also eat the leafy greens. In season the greens taste a lot like spinach leaves. Fodder Beet or Mangelwurzel: The word fodder refers to food grown to feed pigs and cattle. The Mangel-wurzel is a large swollen beet that comes in white, yellow or orange/yellow and has been grown for this purpose for thousands of years. This beet can be consumed by humans if grown in a well-watered, nutrient rich soil which keeps the roots tender, however, the majority of this crop is grown to full maturity for animal feed. Swiss Chard: Swiss chard is the only member of the beet family that is grown for its leafy foliage and not its root. Sugar Beets: These particular beets have white cone shaped bulbs with large leaves and are used in the production of processed sugar. In the mid 1700’s a European chemist proved that beet sugar has the same composition as sugar cane and the beet sugar industry was born! In the mid 1700’s a European chemist proved that beet sugar has the same composition as sugar cane and then beet sugar industry was born! By 1802 the first beet sugar processing plant was established in Poland and beets supplied 5% of the world’s sugar. By 1880 beets suppled 50% of the world’s sugar. Today that number is reduced to only 25%. The first Canadian sugar refinery was established in Farnham, Quebec in 1881. Beets in the 17th century contained approximately 6% sugar, but through cultivation of different varieties todays sugar beets can have a sugar content as high as 20%. Alberta and Ontario are the only sugar beet crop producing provinces in Canada. In 1951 Canada had 38,716 hectares of sugar beet fields. In 2006 Canadian Farmers produced 1.2 million tons of sugar beets mostly in Alberta. Russia is the #1 in the world for sugar beet production.